Oak, maple, birch or mesquite, the varieties of firewood vary from state to state and campground to campground. 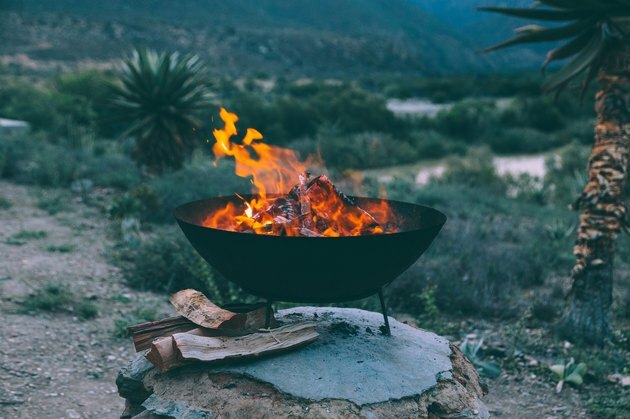 Knowing which firewood burns best for your needs can save you time and soot when creating a memorable fire for the family to sit around and enjoy. There are a number of woods that will burn no matter where they travel and some woods that are better suited for indoors rather than outdoors. Know your wood before striking that first match. When campfire season gets underway, traveling to other parts of the country may confuse you as to which firewood is best. Different regions are home to different lumber. If you are in a new area, you should be aware which trees are best suited for a blazing fire. You don't want to be stuck with a beautiful wood that may burn bright but take hours to get going. If you use non-local wood you may be inadvertently transferring pests to another area of the countryside. Dense and slow to burn, oak is a go-to wood for camping and home use. It produces a lot of heat due to its high amount of energy content stored within the wood and lasts much longer than its counterparts. Maple is another dense and long-burning firewood that doesn't emit a lot of annoying smoke. Within the maple family, look for red and silver maple, Manitoba and sugar maple for your best bet to burn bright and long. The softer woods, such as birch, burn quicker but put out a lot of heat with very little sparks or smoke to ruin the evening. For a fire that carries a fine aroma, cherry and mesquite woods will give you what you are looking for. Ash is a wide-spread favorite found in many parts of the country and burns slow and steady. It's a lightweight wood so it travels well. Wood needs to season outdoors for at least six months before it is ready to be lit. Green wood is a no go when throwing on any fire, whether for inside a home or a fire pit. The sap in green wood can crackle and create a problem if it catches fire at all. If you notice sap, stay away from the wood. Large pieces of wood, those larger than 5 inches in diameter, can create problems and be slow to catch. Soft woods such as firs, cypress and pines can leave soot problems inside a home fireplace. Do Citrus Trees Have Good Wood?